Wisdom are a power metal band from Hungary - a country not really known for its metal scene. In fact I can only think of one other Hungarian band - Velvetseal. Despite this judging by both bands, there is clearly a better metal scene in Hungary than I'd suspected as they're producing some great bands. 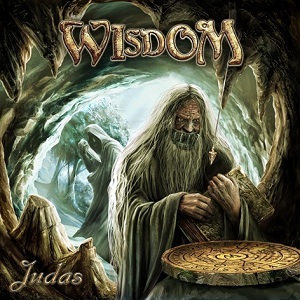 Wisdom released their debut EP in 2004, and have released two albums since then, with this new album, Judas, being their third. In terms of live shows, they have supported a number of big names including Iron Maiden, Judas Priest, Heaven and Hell, Europe, Helloween, Stratovarius, Saxon, Doro, U.D.O. - an impressive list of bands to play with. I have to say that I've been really impressed with this album. I wasnt sure what to expect, not being familiar with the bands music, but I didn't expect to enjoy the album this much - it's been played far too often already and I'm sure I'll be playing it a lot more in the weeks to come. So what's it like? Great songs, some nice guitar work, strong vocals, great choruses - basically great well written power metal that certainly reminds you of some of the bands they've supported - Helloween and Stratovarius in particular. The song "Judas" features a guest appearance from Therion's Mats Levén, where he plays the role of Judas. At almost seven minutes long its by far the longest song on the album, and it's also one of the best - an excellent song. Wisdom will be on tour in September and October supporting Sabaton and Eluveitie across Europe. I definitely intend to get to one of those shows as having listened to the new albums from all three bands I can say with confidence that this is a superb lineup with three great bands on one bill. A great album that you really need to listen to.